Last week we talked about how your exit strategy could be complex in nature so you can trade what is in front of you. The market changes during your trade and managing your position with aplomb requires more than one — or even just two — simple exit rules. This week we continue to delve into the topic reviewing the final six of our nine main types of exits. If you did not read the first part of the article last week click here. In that article, I covered the reasons why complexity in your exit rules can be good and I explained that I am writing from the perspective of a rules based discretionary trader. 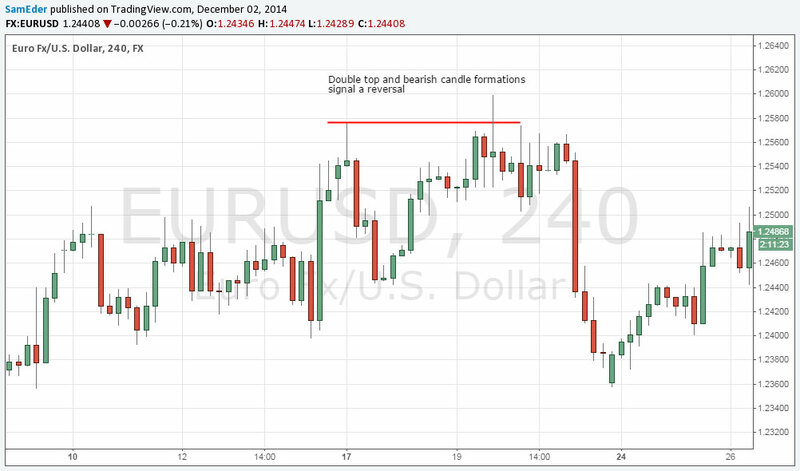 • A candlestick or bar formation. • A candlestick or bar formation on a different time—frame chart. 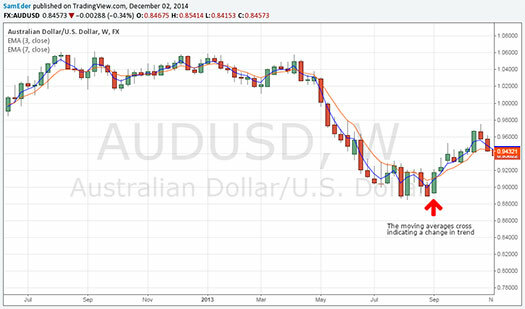 • A close over a key support or resistance level. You may want to apply some or all of these reversal indications. If this happens to you, then you are faced with a decision point. Do you now exit the position, lighten the risk amount, or leave it alone and see what happens? There are possible reasons for each path so consult your objectives and know what you will do ahead of time. Also note that reversals right after entries often offer a good entry for a trade in the opposite direction of your original one. Sometimes your trade enters a nice efficient phase where it steadily moves in your direction. Anyone can easily continue to hold a position during this kind of period but what do you do when price then reverses? 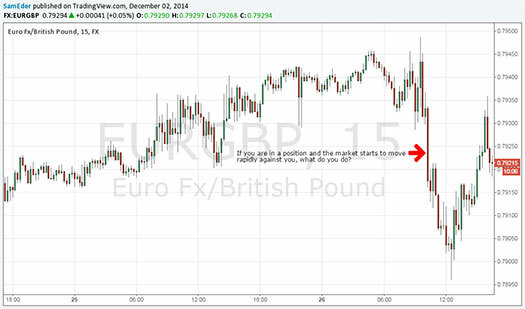 Do you exit the trade immediately or do you decide to hang on until the trend re-establishes itself? Be sure to consider your objectives for the trade when you make this decision. Technical indicators such as Bollinger Bands and Moving Averages can serve as trailing stops to help you manage intra-trade drawdowns. As a general rule, the longer the timeframe of the indicators you use to manage intra-trade drawdowns, the larger the drawdowns will be but conversely, you will have greater chance for a larger win in the end. Contrary to some popular beliefs, tightening your stop is good when the market moves quickly in your direction. Fast moving markets can rapidly reverse and chew though the profits you have made. For this kind of move, it’s best to lock profits in and wait for a re-entry. Sometimes, this means that you may miss out on a move as your position gets stopped out but more often than not it will save your skin. There are a few techniques you can use to retain your profits in a fast moving market. 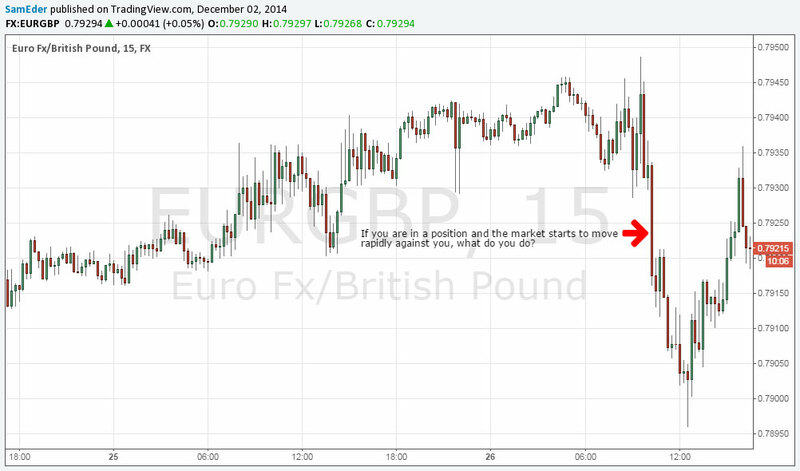 You need to react quickly when you encounter this scenario so be sure to use a rule that is congruent with your trading style and objectives. One of the more uncomfortable scenarios to face is when the market moves suddenly against you. This can happen when there is either unexpected news, or a global macro-event, or a sudden change in supply and demand. If this happens, you have a couple of choices depending on your trading style and your view of the strength of the reason for the drop. You could get out immediately or you could wait and hope that the position rebounds in your favor. This can be a very challenging decision to make but whatever you do, keep risk management at the top of your mind. One compromise for this scenario is to move your stop up tightly below the current price. 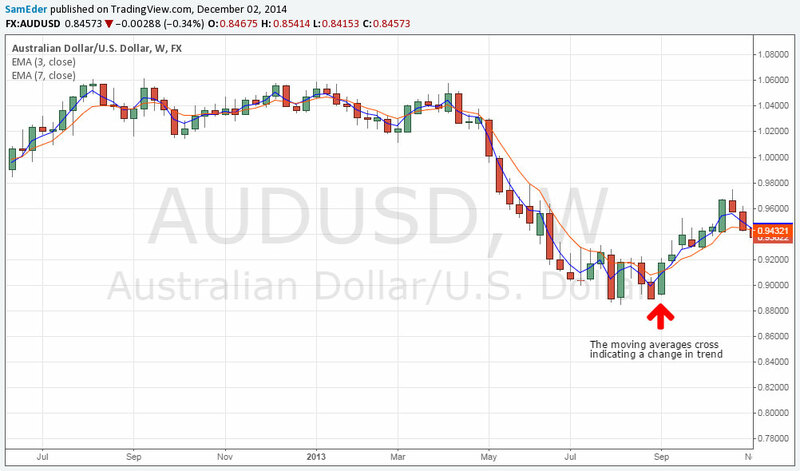 If price recovers then your position will benefit but any further losses would be strictly limited. An all too common occurrence for newer traders is to have their trade move almost to the profit target, not quite hit it, and then the price falls all the way down to the stop loss. This can be a classic case of turning a winner into a loser. Not only does this cost the trader profits, but it can be frustrating and psychologically damaging in the long run. A remedy for this ill is to make sure your reward to risk ratio during a trade is never less than 1:1. Managing your exit point in this way has you effectively tightening your stop once you start getting close to your profit target. Often the charts act as a window into the soul of a trade. If you see that price is about to reverse, now is the time to act to protect your profits. But some reversals are not as strong as others and you don’t want to be cutting your profits short by exiting on weak signals. You will be tempted to close your trades early if you don’t have this aspect of your exit strategy down pat. If you do see a reversal and you are unsure if you should close your position or not, then you can always scale out or move your stop higher. A change in the news cycle from positive to negative can be a good time to exit your position. For example, if the market was ignoring bad news and continuing to push higher, then you would continue with the trade. But if all of a sudden, the market starts selling off in reaction to new bad news, then you know that something has changed either fundamentally or sentimentally and it’s time to sell. 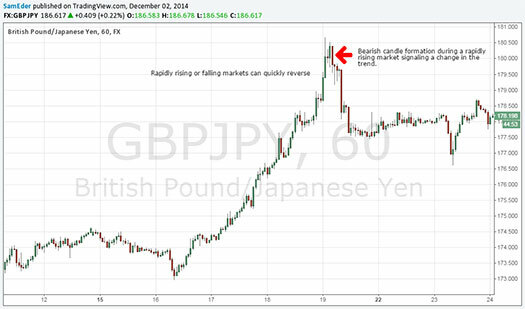 Similarly, there could be a macro event or other news that could drive a sudden change in the price movement. If your assessment is that this event is likely to continue influencing the market or your position, then you should also close the trade. Note — if you get good at executing condition change exits, they can be quite powerful – enough so that you should prioritize them over more simplistic technical exit rules. As you plan your exit rules, make sure they align with the objectives of your trading system and that you have them written down. Their individual use should be preplanned based on the careful identification of decision points and not merely applied on a whim. Adding a series of well thought out exits that cater to different conditions is one of the best ways to improve your trading strategy and portfolio performance. How can you add new exit rules to your trading plan so that you can trade more profitably? About the Author: Based in New Zealand, Sam Eder trades currencies using rule-based discretionary systems. 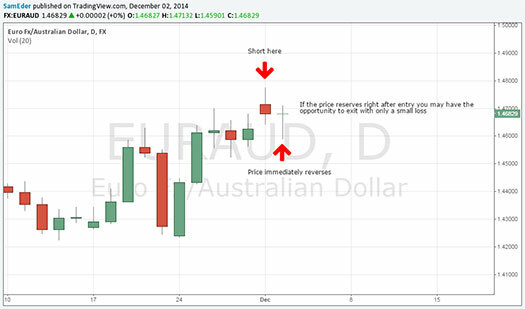 He has studied Van Tharp’s trading principles extensively over the last 10 years and incorporates many of those when writing his daily blog posts on his Forex signals service FX Renew.